Nancy Payne, an instructor in the School of Social Work, has been named a 2019 Innovation Spirit Scholar for her innovation project exploring the concept of how to better serve students and faculty with invisible disabilities in online courses. As an Innovation Spirit Scholar, Payne will continue to her work in the area of invisible disabilities with the support of UA’s Innovation Scholar Team, a new resource through UA’s College of Continuing Studies aimed at supporting and enriching online course development for faculty and content experts. 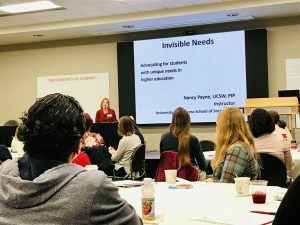 In exploring how to best serve students and faculty with invisible disabilities, Payne showed how working together the UA community can support faculty and students with invisible disabilities, both on campus and online. UA’s Innovation Scholar award programs is a competitive program that supports faculty’s innovative efforts in online learning. The programs fund faculty projects large and small, individuals and teams. The Spirit Scholar designation recognizes the important student impact of Payne’s project and its iterative potentials. Payne, joined by other innovation scholars and mentors, was recognized at a reception Jan. 24 and participated in a opening plenary session Feb. 1 at the Online Learning Innovation Summit.